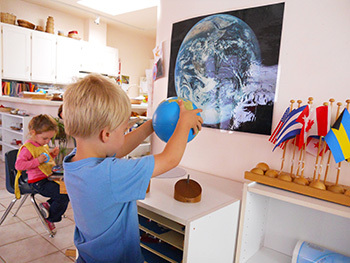 A Montessori education is an established philosophy and method originated by Dr. Maria Montessori in the first half of the 20th century. It was her belief that the goal of early childhood education should be to cultivate the child’s own natural desire to learn. She created an approach to education that would best enable children to develop their learning abilities, independence, and initiative, and stimulate within the child a genuine love of learning. Children from eighteen months old to three years old are in the toddler class, and children aged three to six years old are in the preschool class. Each provides a setting where learning takes place naturally from the prepared environment, the teachers and the other children. The materials are designed to attract the interest and meet the developmental needs of each child and to integrate the child’s expanding knowledge. Classrooms are bright and cheerful and are structured to enable a child to explore within his or her abilities. 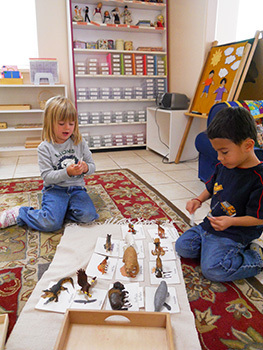 The Montessori materials have a “control of error” inherent in their design or presentation, so that children can work independently and learn through their own efforts. All activities are directed toward helping children develop positive attitudes about themselves, their world, and a lifetime of learning. Dr. Maria Montessori (1870—1952) believed that children of the present are the world’s hope for the future. She believed that children possess an intrinsic desire to explore, discover, absorb and learn about their environment. It is in these early years that children develop the social, emotional, physical and intellectual foundation on which they build for the rest of their lives. act on their environment through practical exercises such as food preparation, cleaning, pouring and sweeping, designed to help develop concentration, order, coordination and independence. complete a cycle of activity. refine their senses and become aware of similarities and differences through the sensorial materials. learn about the cultures around them. begin to use language and math as tools to learn about the world around them. develop a concept of mathematical relationships. develop a sense of independence. All the components of the program exist for the child, and our goal is to provide an environment in which the child can work to create the person he or she will become. Montessori observed that adults work to perfect the environment, but the child works to perfect himself.